Shakespeare came of age in London, one of the great capitals of Europe, during the reign of Queen Elizabeth I, and later King James I. This era of exploration and discovery was also a golden age for literature: Shakespeare composed his works alongside Christopher Marlowe, Ben Jonson, and Edmund Spenser. It was also an age of turmoil, filled with conspiracies, rebellions, and plots, including the Gunpowder Plot to assassinate the king and blow up Parliament in 1605. Shakespeare’s creative life, then, was not one of solitude, but of active engagement. He often drew inspiration (even borrowing plots and characters) from other works, including histories, previously written plays, and popular tales from both home and abroad. Turning to books, manuscripts, maps, and other objects as his sources, Shakespeare produced works that were also shaped by his fellow writers and actors. His creations appealed to cosmopolitan audiences, who were eager for entertainment that gave voice to their past and present. Shakespeare’s name was not consistently spelled in one way during his lifetime, and it has appeared in a variety of ways over the centuries. While Shakespear and Shakspeare were popular forms in the 18th century, by the 19th century, some thought Shakspere was more authentic, as it was the form used in two of the six known signatures of Shakespeare (all on legal documents). 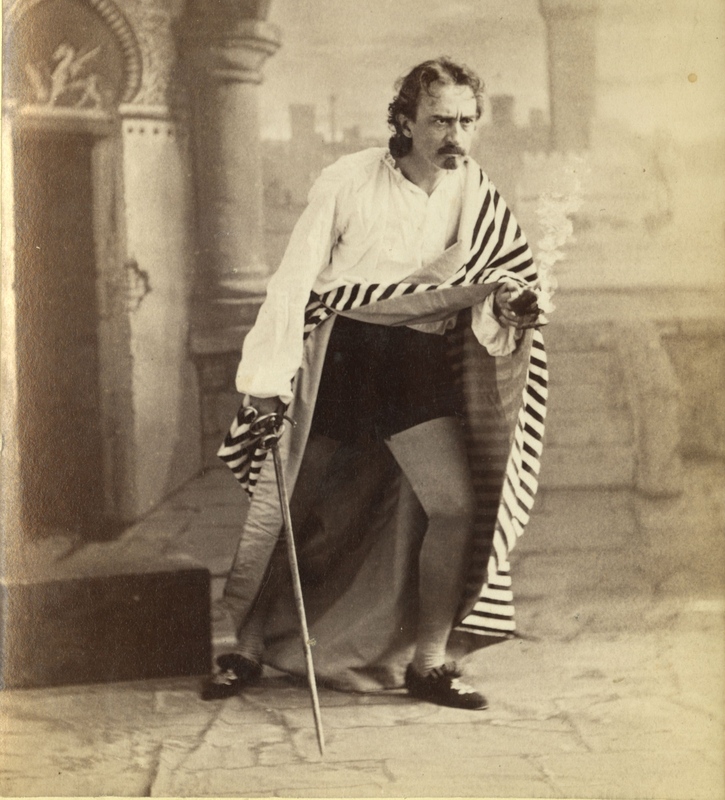 Shakespeare became standard in the 20th century. Throughout this site, we have transcribed the name exactly as it appeared in works created through the centuries. There are no complete manuscripts of any of Shakespeare’s plays from his lifetime, but surviving manuscripts by other playwrights provide information about how plays were written and performed in that era. Masques were entertainments with elaborate costumes and scenery produced for and often performed by the royal court. In 1619, John Fletcher and Philip Massinger, both of whom wrote for Shakespeare’s company, the King’s Men, wrote a play about the trial (for high treason) of Johan van Oldenbarnevelt, a Dutch politician. Using printed news accounts as their sources, Fletcher and Massinger produced their play within three months of van Oldenbarnevelt’s death. Shakespeare was a lively presence in London, acting in plays, working among (and at times with) other writers, and even competing with his peers for women. Numerous sources from his own lifetime mention him, in critical contexts as well as social ones. In 1606, students from Cambridge mentioned Shakespeare in a play called The Returne from Pernassus, in which the characters discuss contemporary dramatists, with one claiming that few university men “pen plaies well …Why heres our fellow Shakespeare puts them all downe.” The play also includes two characters called “Burbage” and “Kempe,” after actors from Shakespeare’s company. Appearing in three plays and mentioned in a fourth, the character of Sir John Falstaff has more lines than any other Shakespeare character except Hamlet. Falstaff was a popular character from his first appearance on stage, as evidenced by his prominence on early title pages of Henry IV, Parts 1 & 2. Although he dies offstage in Henry V, in 1602 Shakespeare revived him for a “spin-off”--The Merry Wives of Windsor. Can Honour set too a leg? No: Or an arm? No: Or take away the grief of a wound? No…. What is Honour? A word…. Who hath it? He that died a’ Wednesday. Doth he feel it? No. Doth he hear it? No…. In the 1660s, Falstaff was the first Shakespeare character to appear as an illustration, in Francis Kirkman’s The Wits, or Sport upon Sport, a collection of drolls, or skits, that travelling actors could perform. 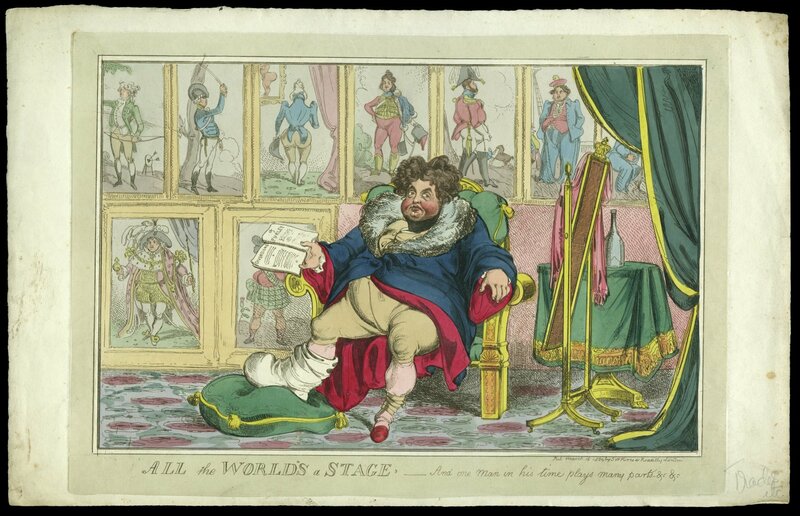 Because the character symbolized a degenerate lifestyle and was readily recognized, Falstaff appears frequently in 18th- and 19th-century satirical prints mocking political figures. In the print False Liberty Rejected, the Prince of Wales (later King George IV) is depicted as Prince Hal giving a speech in which he rejects Members of Parliament Charles James Fox and Richard Brinsley Sheridan (portrayed as Falstaff and Bardolph, respectively). 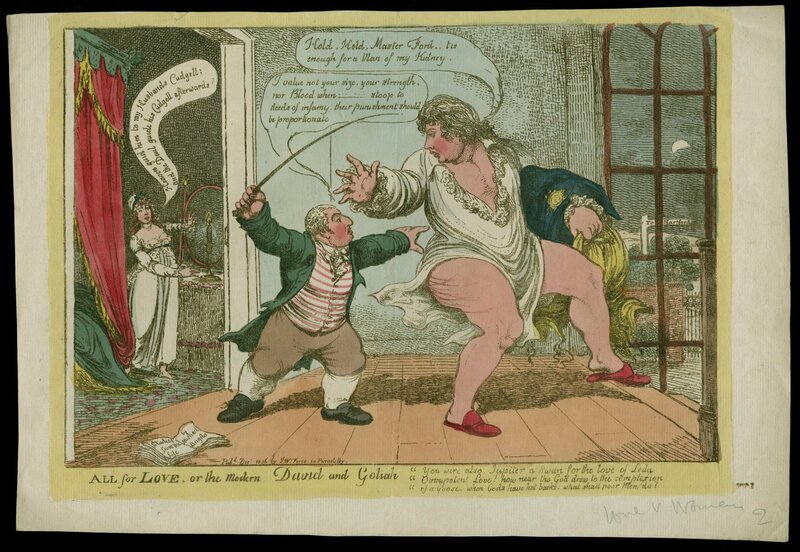 Later, George’s corpulence often led to his being portrayed as Falstaff: All for Love mocks his infatuation with the married Lady Hertford; while All the World’s a Stage traces his increasing girth. The character known as “Sir John Falstaff ” was originally “Sir John Oldcastle,” and was based on a real person, a friend of Henry V and member of the “Lollards,” a religious group who promoted reform within the Church. After plotting to kill the king, Oldcastle was executed in 1417. The antiquarian Richard James once noted in a letter that because Oldcastle was a “buffoon” in the plays, his descendant William Brooke, 10th Baron Cobham, took offense: Brooke became patron of Shakespeare’s company, the Lord Chamberlain’s Men, in 1596 and used his stature to get the character’s name changed. The replacement name that Shakespeare chose was based on another friend of Henry’s – the career soldier Sir John Fastolf. Some remnants of the original name survive, including a reference in Henry IV, Part 1, when Prince Hal refers to Falstaff as “My old lad of the castle.” In this copy of Henry IV, Part 2, the name Oldcastle (“Old.”) still appears on the bottom of the left page. Oldcastle later became the subject of his own play. Scholars originally ascribed the play to Shakespeare, but now believe it was written by Anthony Munday, Michael Drayton, Robert Wilson, and Richard Hathway. In the early 17th century, the folio format was usually reserved for subjects like theology or history–not drama, which was considered lowbrow entertainment. What we now call the Shakespeare “First Folio” was the first folio book published in England that consisted entirely of plays. Half of the 36 plays included in the book had never before been printed; without it, plays including Macbeth, The Tempest, and Twelfth Night would not have survived. About 750 copies of the book are thought to have been printed; 235 copies are extant. The earliest recorded purchaser of the book is Edward Dering, an English antiquary who bought two copies in December 1623. That same year he created a manuscript for an amateur production of Henry IV, Parts 1 & 2. The manuscript is in two different hands, one belonging to Dering, and the other to a professional scribe. Dering altered the text for performance, cutting 3,000 lines of Shakespeare’s text and adding 50 lines of his own creation.